Guy Darrells’ old eCommerce website was limiting them. 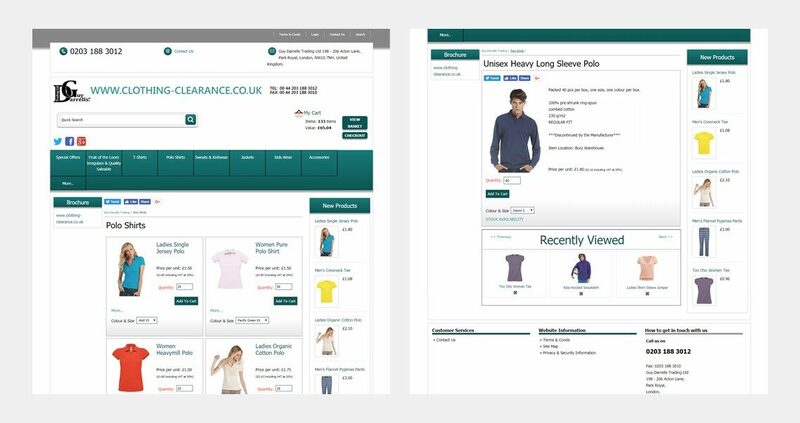 We built custom functions and features on the Magento 2 platform, giving the website a fresh look and centralising their inventory. Established for over 40 years, Guy Darrells is a clothing wholesale supplier, with offices in London and Manchester. They work with a huge range of products, buying and selling discontinued and overstock clothing in brands such as Fruit of the Loom, Gildan and B&C Collection. Guy Darrells was using a proprietary system that was too complicated, and limited in its feature set. Uploading products was a laborious process for employees, and stock was incredibility difficult to manage, which at times led to orders that couldn’t be fulfilled. Guy Darrells’ core inventory management was based on Excel sheets and the use of Dropbox, because multiple members from their London, Manchester and Ireland offices needed to access and edit the files. This was highly time-consuming and inefficient, wasting time which could be better spent elsewhere. 2simplify were hired to develop a brand-new website. Specifically, we needed to create a B2B-focused website suitable for a company like Guy Darrells which would not only look appealing to customers but would allow for quick and easy inventory management by their team. We spent a lot of time with Guy Darrells’ Sales and Operations team, to understand how they worked and to learn about their industry. With products only sold in cartons, the unit price was most important rather than the carton price. This had to be made crystal-clear on the website as if there was any lack of clarity whatsoever, it could lead to confused customers and missed sales. We also grew to understand just how vitally important the stocklist is in the wholesale industry. 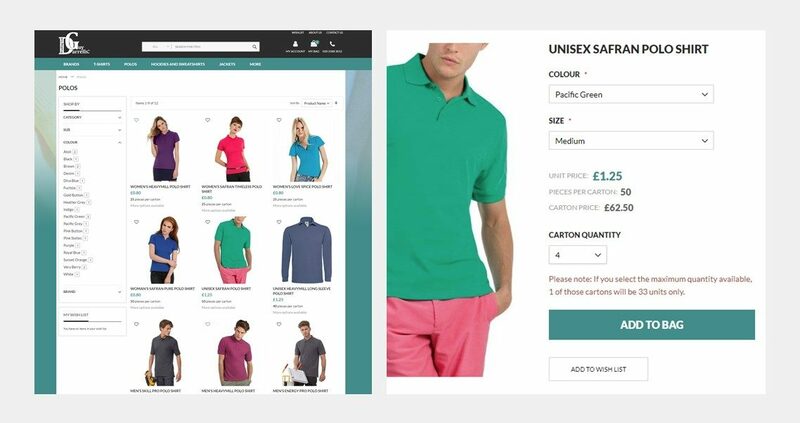 Guy Darrells’ customers needed to be able to easily see a full itinerary of the available stock, so they could strategically decide what and how much of each product to buy. Guy Darrells use a unit base pricing model based solely on carton sales; something which Magento’s default functionality wouldn’t allow. We needed to build a new, more flexible framework, which enabled the team to enter pieces per carton, along with the total number of units available. The pieces per carton aren’t always a factor of the total number of units available, which we also took into account. 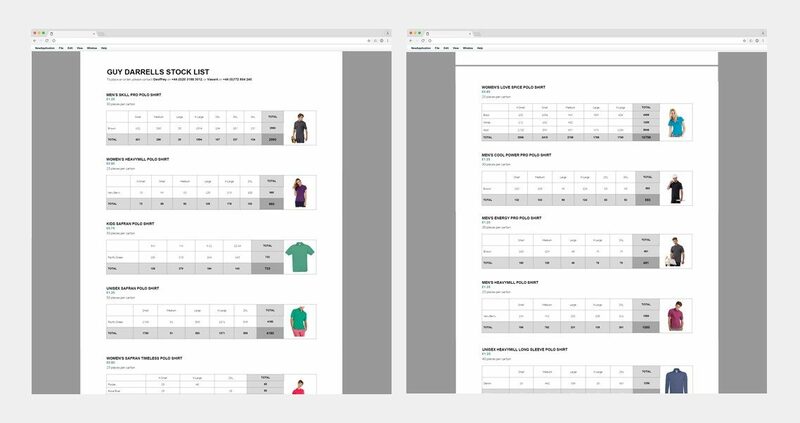 We also made it possible to generate a PDF stocklist, based on a category and brand selection, detailing all pieces available for each size and colour variation. This was a crucial requirement; Guy Darrells’ customers often request stocklists, and now - instead of manually editing then sending an Excel document which was time-consuming - their staff can generate this document with the simple click of a button. It was vital that we made the shipping options completely transparent as we found this to be a factor in conversion rates. We wanted to do this early in the sales process, by displaying both custom shipping options in the “My Bag” page, instead of the checkout screens. This allows users to understand the shipping before having to enter all their details. Typically, shipping is only available to the UK, however, international shipping can be arranged directly via the sales team. 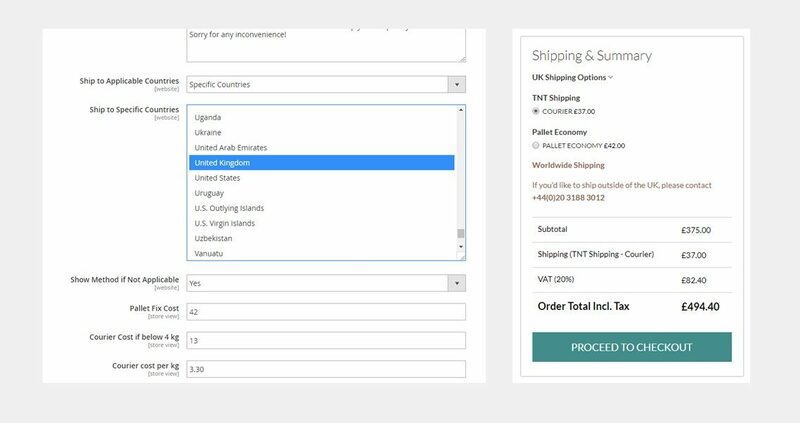 We didn't want to discourage potential international customers, therefore, we displayed a message in the “My Bag” page clarifying that customers can call for tailored worldwide shipping options. International customers will no longer enter their details, only to discover shipping is unavailable which was a great source of frustration for them and ultimately effected sales. In short, we made the entire sales process became quicker and smoother. The new website which 2simplify designed provides customers a much-improved path to products, based on their intended purposes. We wanted to ensure all prices and units were clear to the user, to prevent returns and loss of goodwill. The new website provides the unit prices, pieces per carton and carton prices in a format that’s extremely easy for the user to process. Want to meet to discuss your project? 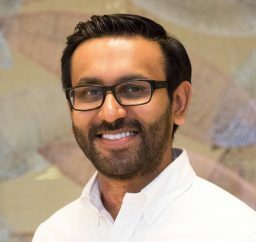 Ramesh is on hand to answer your questions.